He didn’t know it yet, but on this date in 1793, a brilliant adolescent named André-Marie Ampère lost his father to the guillotine. If the name sounds familiar, it’s because it would eventually become the SI unit of electrical current. Andre-Marie Ampere, one of the founding pioneers of electromagnetism (Ampere called the new field “electrodynamics”) lost his father to the French Revolution’s guillotines. The father in question was Jean-Jacques Ampère, an intelligent and levelheaded man whose sense of duty outweighed his instincts of self-preservation. He was determined to do every job he had to the best of his ability — whether the task was educating a son or discharging the office of justice of the peace — and this diligence cost him his life. A bourgeois silk merchant (a quintessentially Lyonnais occupation), he lived with his wife and son in a tiny village outside of Lyon called Poleymieux-au-Mont-d’Or. It was there that he and his wife, who were one of only five bourgeois families in a primarily peasant population, raised the boy who would grow up to be the father of electrodynamics. In 1782, he retired and devoted himself full-time to his children’s upbringing — particularly that of his son, whom he soon realized was not an ordinary child. Born partly of necessity (Poleymieux lacked a school) and partly of choice (Jean-Jacques had, after all, opted to move to Poleymieux, and some speculate that he wished to give his son an upbringing like the one advocated by Rousseau in Émile), André-Marie’s unorthodox education resembled what today’s DIY pedagogues might call “unschooling”: he was encouraged to take charge of his own learning, given access to his father’s library, and taught a variety of eclectic subjects according to what most held his interest at the moment. For most children, this technique is questionable; but when your kid happens to be a genius and a polymath, it works just fine. André-Marie was an audodidact and proactive in his learning, which would be a force for good in his life: as we’ll see, it was what pulled him out of his depression after his father’s death. When the Bastille fell in 1789, not much changed at first. Jean-Jacques embraced the ideals of the Revolution and even wrote a play called Artaxerxe ou le Roi constitutionnel [Artaxerxe or the constitutional king], which James Hofmann, author of André-Marie Ampère: Enlightenment and Electrodynamics, sees as a parable containing Revolutionary themes. As has been detailed in the post on Joseph Chalier, 1793 was not a good year for the Lyonnais. The Revolution ran counter to the grain of Lyonnais culture for a number of historical reasons (the strong Catholic tradition and the silk trade being two of them). More immediately, famine and taxes had not disposed the people of Lyon towards the local Revolutionary government — particularly the far-left Jacobin faction, which continuously struggled for control of the city. When the Jacobins seized power in March 1793, they provoked opposition from Girondins and royalists alike, and on May 29 important members of the Jacobin leadership were arrested. Among those apprehended was Joseph Chalier, head of a major Jacobin club known as the “Central Club.” Someone had to open the case against Chalier, and that someone was Jean-Jacques Ampère. Paris responded by placing Lyon under siege on August 9, and two months later, the city surrendered to the Convention. Rather than flee, Jean-Jacques remained in the city, resolved to see his duty through to the bitter end. Throughout the siege, he instructed his wife not to tell their children of the danger he was in. When Lyon was taken, he was immediately arrested, and in the six weeks he spent in prison, he had little doubt about his fate. Much of his trial is preserved in court documents. They refer to Lyon as “Ville-Affranchie” — “Liberated City,” the name Bertrand Barère gave to the town before declaring, “Lyon has made war against liberty; Lyon is no more” — so you know they mean business. During his interrogation, Ampère père was accused not only of having issued the warrant for Chalier’s arrest, but also of having sentenced male and female Jacobin club members to public humiliation and having their eyebrows shaved off, respectively — as well as just generally having been a jerk to Jacobin detainees during interrogations. The responses he gives show a man resolved to keep both his pride and his honor in the face of certain death, a functionary convinced that he had committed no wrong. Ampère admits to having had Chalier arrested but vehemently denies the other charges. He was also asked if he had left his post and/or sent a revocation to Paris, and responded that he had kept his post and had “no revocation to make.” This probably sealed his fate. Interrogation of Jean-Jacques Ampère, 61 years of age, justice of the peace of the canton of Halle-aux-Blés, residing in Lyon, Quai Saint-Antoine, Number 44. — Responses he gave. I was in Lyon during the siege. I never had any correspondence with the so-called constituent authorities in Lyon. Question: You are accused of having filed the whole procedure against the patriots, of having been president of the correctional police during the whole time of the counter-Revolution, and of having judged those who had committed no crime other than belonging to the [Jacobin] club, sentencing the men to be tied to the post [this refers to a punishment formally known as “exhibition,” which was sort of like the pillory] and the women to having their eyebrows cut off; of having condemned, among others, Cadet Rufard, member of the [Jacobin] club, to six months of imprisonment for having sought bread for his brother, put in chains on May 29. You are reproached with having said to all of those whom you interrogated, “You are scoundrels, you people with your clubs; you had agents all the way out in the country, and your plot was the destruction of honest people.” In a word, you are accused of the assassination of the virtuous Chalier, since it was you who filed the first procedure, and it’s thanks to your arrest warrant that he mounted the scaffold. Response: I never had any part in the judgments against patriots, men or women, which pronounced the sentence of pillory against the men and shaved eyebrows against the women; I admit to having filed the procedure against Citizen Chalier, on the declaration that had been made to me on May 27 by the public prosecutor who had the right to provoke my ministry; I also made several investigations against certain municipal officers after May 29, and in ruling on these procedures, I followed the law in sending back the accused in the presence of the director of the jury, the indictment alone regulating the jurisdiction. I conformed to the investigation of the functions of police officers who are uniformly employed to gather the vestiges of crimes and send the judgment back to the courts who should be informed of them. The circumstances were such that prudence joined with my sense of duty in making me carry out the measure indicated by the law. Before ruling on the procedure against the municipal officers, I had also ruled on the fate of a municipal named Sautemouche. I let him out under an oath to return, and soon after his release, the unfortunate Sautemouche succumbed to the blows of malicious persons. He was murdered, and most of the sections shouted for my arrest, because I had obeyed my conscience and my opinion by delivering an innocent man. Question: Did you leave Lyon and did you send your revocation to the Committee of Public Safety, according to the law? Response: I have no revocation to make. Question: Did you continue your functions during the siege in a city in revolt? Response: Yes, from May 27 until the beginning of August. Question: Did you issue the warrant for Chalier’s arrest? Response: Yes, on June 7. On November 22, the same day as his trial (other sources give the date as November 23, 24 or 25, but I’m going by the date of execution given in legal documents), he was guillotined in Place Bellecour along with three men who appear not to have been involved in the affair: Étienne Chazottier, a lawyer and the president and secretary of the “permanent section” (a local political office), for “offenses against patriots”; Pierre-Elisabeth Chaponnay, an aristocrat, for “giving considerable sums to, and favoring the plans of, counterrevolutionaries”; and Jean Freidière, a geometer and secretary of the “surveillance committee” — no crime given. Ampère was 61 years old. My dear angel, I have received your comforting letter; it was a life-giving balm to the emotional wounds that had been inflicted on my soul by my regret at being misunderstood by my fellow-citizens, who have denied me, through the most cruel separation, a homeland that I have cherished so much and whose prosperity is so close to my heart. I wish for my death to be the seal of a general reconciliation between our fellow-men. I pardon those who rejoice in it, those who caused it, and those who ordered it. I have reason to believe that the national vengeance, of which I am one of the most innocent victims, will not extend to the few possessions that have been sustaining us, thanks to your wise money-saving and our frugality, which was your favorite virtue … After my trust in the Eternal, to whose breast I hope will be taken that which remains of me, my sweetest consolation is that you will cherish my memory as much as I cherished you. That much is owed me. If from my home in Eternity, where our dear daughter has preceded me, I am able to attend to things on earth, you and my dear children will be the object of my care and concern. May they enjoy a better fate than their father and always have before their eyes the fear of God, that salutary fear that makes innocence and justice act on our hearts in spite of the fragility of our nature! … Do not speak to Josephine [André-Marie’s younger sister, then about eight years old] of her father’s misfortune — make sure she does not know about it; as for my son, there is nothing I do not expect of him. As long as you have them, and they have you, embrace each other in my memory: I leave you all my heart. 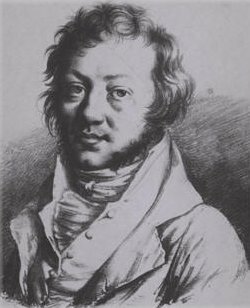 The Jacobins greatly spun the proceedings against Ampère; in a November 25 letter to the Convention, Collot d’Herbois and Fouché claimed that: “It was liberty that they wanted to assassinate in killing Chalier; his executioners have confessed it; before coming under the blade of justice, they were heard to say that they were dying for the king, that they had wanted to give him a successor.” It goes without saying that there is no reason to believe that Ampère said any such thing on the scaffold—he lived and died a Republican. To say the execution was a shock to the eighteen-year-old André-Marie would be an understatement. He never truly recovered from the death of his father, which was neither the first nor the last personal tragedy that would befall him; his older sister Antoinette had died a year earlier, and he would also lose his first wife after only four years of marriage. James Hofmann points out in Enlightenment and Electrodynamics that Jean-Jacques was André-Marie’s only link to the world outside Poleymieux, where he was socially isolated in addition to being intellectually stimulated (his undersocialization did indeed have a permanent effect; he was extremely awkward all his life). Yikes. Arago claims that André-Marie was able to snap out of it with the help of Rousseau’s writings on, of all things, botany: “This lethargy of all moral and intellectual feeling had lasted for more than a year, when the letters of J.-J. Rousseau, on botany, came into Ampère’s hands. The limpid and harmonious language of this work entered the soul of the sick young man and partially gave him his nerves back, as the rays of the rising sun pierce the thick fogs of morning and bring life to the heart of plants stiff from the night’s chill.” With that, Ampère’s intellectual life reawakened; he began to study, and eventually became more or less functional — although, according to Hofmann, direct discussion of the event remained a taboo subject. Indirect references are another matter; he named his son Jean-Jacques, in memory of his father and also, some speculate, as an homage to Jean-Jacques Rousseau.